A new special series with images that are 100% Belgium! 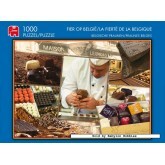 Great as a gift and perfect to bring that warm fuzzy feeling of Belgium's finest memories right into your living room. Made in Belgium There is 1 product.